This edition differs from the second chiefly in the addition of about tOO pages devoted to the quantum (or geometric, or Berry) phase, a subject that did not exist when this book was written. The changes in the remainder of the book consist of corrections of a small number of misprints. 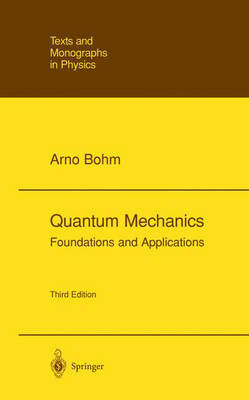 While it may seem that adding two chapters on the quantum phase is overemphasizing a currently fashionable subject, they actually complete the development of quantum theory as given in this book. We start with simple models, synthesizing them into complicated "molecules." With the new chap ters, we end with complicated "molecules," dividing them into simpler parts. This process of dividing a complex system into parts quite naturally gives rise to a gauge theory, of which the geometric phase is a manifestation - with consequences not only in theory, but observable in experiments. For this rea son, the geometric phase is not a mere fashion, but a discovery that will retain its importance forever and must be discussed in textbooks on quantum mechanics. I would like to acknowledge help and advice from Mark Loewe with the writing and also of the new part of the book. In addition, I would like to express my gratitude to J. Anandan, M. Berry, and C.A. Mead, who have read parts or all of the new material and have provided valuable advice."